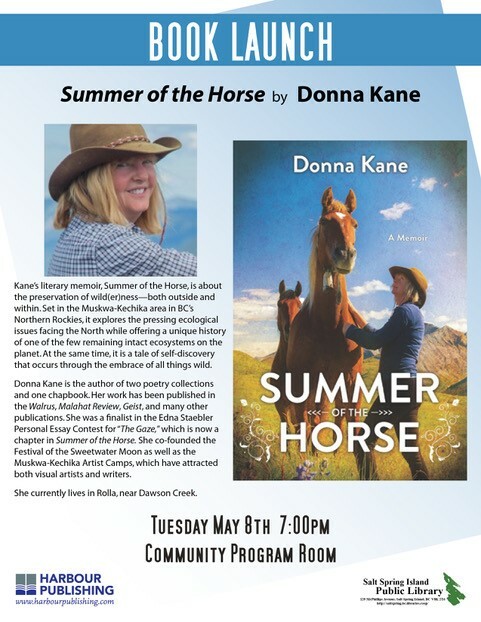 Kane’s literary memoir, Summer of the Horse, is about the preservation of wild(er)ness—both outside and within. Set in the Muskwa-Kechika area in BC’s Northern Rockies, it explores the pressing ecological issues facing the North while offering a unique history of one of the few remaining intact ecosystems on the planet. At the same time, it is a tale of self-discovery that occurs through the embrace of all things wild. Donna Kane is the author of two poetry collections and one chapbook. Her work has been published in the Walrus, Malahat Review, Geist and many other publications. She was a finalist in the Edna Staebler Personal Essay Contest for “The Gaze,” which is now a chapter in Summer of the Horse. She co-founded the Festival of the Sweetwater Moon as well as the Muskwa-Kechika Artist Camps, which have attracted both visual artists and writers. She currently lives in Rolla, near Dawson Creek.